Books and Towels: Relief for Plantar Fasciitis? Let’s talk about feet. Or, more precisely, heels. As a massage therapist, I have no silver bullet for plantar fasciitis. Most of my PF-specific work focuses on releasing the posterior calf muscles: gastrocnemius, soleus, tibialis posterior. If that group, and the encasing fascia can relax, the calcaneal tendon will lengthen, and the plantar fascia won’t be pulled so damn tight. I also do work at the plantar fasciia, and the supporting musculature of the lower leg. 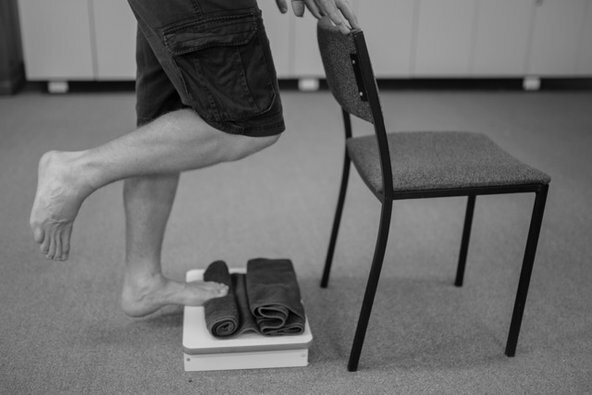 There’s other factors to consider: gait, hip alignment, pronation, training volume, and muscular imbalances can contribute to developing plantar fasciitis. In the past, I’ve suggested that my clients stretch their calf by pulling their toes towards their shins or change their footwear. But things might be changing, with a single exercise, involving my most beloved objects– books and towels.